I love Japanese patterns. The more I make garments following Japanese patterns, the more I admire them. Why? Because they are so compact and clear. Everything is there on one page (yes, one page, unless you need one additional page for schematics) with minimal wording. Words don't help me because I don't know Japanese but the numbers do. A lot. Once you figure out what they mean (and it is not difficult to figure out, or you can visit this and this websites for help) it is just a breeze. Here is one of the last patterns that I bought from Brooklyn Tweed. See how many pages? 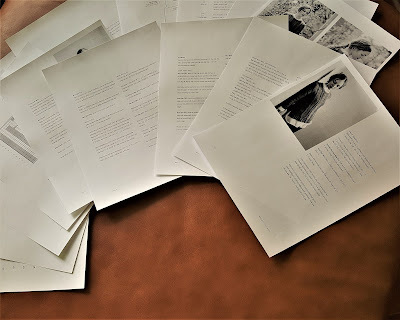 It is mind boggling how one pattern can be stretched onto so many pages! And why? Maybe because otherwise you won't feel satisfied enough after paying $9 and getting a measly one page with a pattern? It seems that lately designers decided that we (knitters) need as many pages for our money as it is humanly possible... and impossible. If you want to know my opinion (you must, otherwise you wouldn't be reading all this), all these pages are extremely confusing, to say the least. Patterns become cumbersome if printed out and totally unworkable if used on a tablet or other device when you don't have a printer close at hand. Plus you get in trouble much more often, because when you discover yet another "At the same time", you are too far gone already and have to unravel a big chunk of your work. Or maybe someone memorizes patterns like poems? I don't. Another thing that I totally hate in written patterns is when being long and wordy they still don't give you all the information necessary and you need to go online and download some additional material. For example, when I was making Slope, the pattern had links to its abbreviations and techniques that I had to download separately. I was traveling at the time and was using my Kindle for references. It was a nightmarish experience because I had to close and open files back and forth till I memorized all that I needed. In Japanese patterns you see everything at once and AT THE SAME TIME. Everything is given AT THE SAME TIME here. I've been collecting Japanese knitting books for a while and made several patterns from them. Yet, some patterns - the best in my opinion - seemed too complicated at the time, or I didn't have any yarn that would work for them. So I had put them on hold. Last month in Florida I was finishing Wolf River and thinking about next project for which I actually had yarn and a pattern when I decided to take a look at some of my chosen but postponed Japanese patterns. Bingo! I saw this adorable black and white sweater from Keito Dama # 128 (it is right on the cover, and the model is impossibly cute). Black and white seems to be basic enough (since we are having a Summer of basics Make-Along) plus I had Rowan fine tweed in black and white with me that I could use for this pattern. The only problem - there was not much free time for knitting. All three weeks in Florida we were extremely busy. We moved all our stuff to the new house, cleaned the old one, cleaned and furnished the new one and did some work outside of the house. What project a normal person would pick while doing all this in three weeks? Right, something mindless, easy, if anything at all. 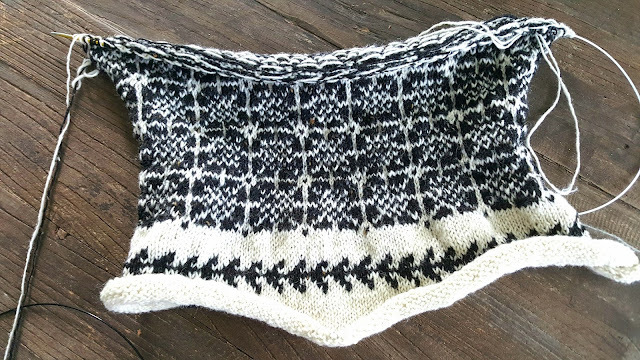 Yet, I started this uber-complicated fair isle sweater on tiny needles with thin yarn. Honestly,I didn't mean to finish it quickly. I only wanted to try the pattern. It is really whimsical, reminds me of the Rorschach test: sometimes you see squares, sometimes - circles in it. Actually there are several patterns. One is used on the back and sleeves, and two more - on the front. I thought it would be something to look forward to between moving heavy objects and packing/unpacking things. I couldn't work all the time, could I? And during breaks I could make a row or two. The pattern asks for provisional cast on for all pieces. And I made it in pieces, not in the round. Because, as I have already explained, I think that it fits better that way. Previously, I used this simple device (circled in red!) to knit fair isle in the round. I never used it for knitting back and forth before. 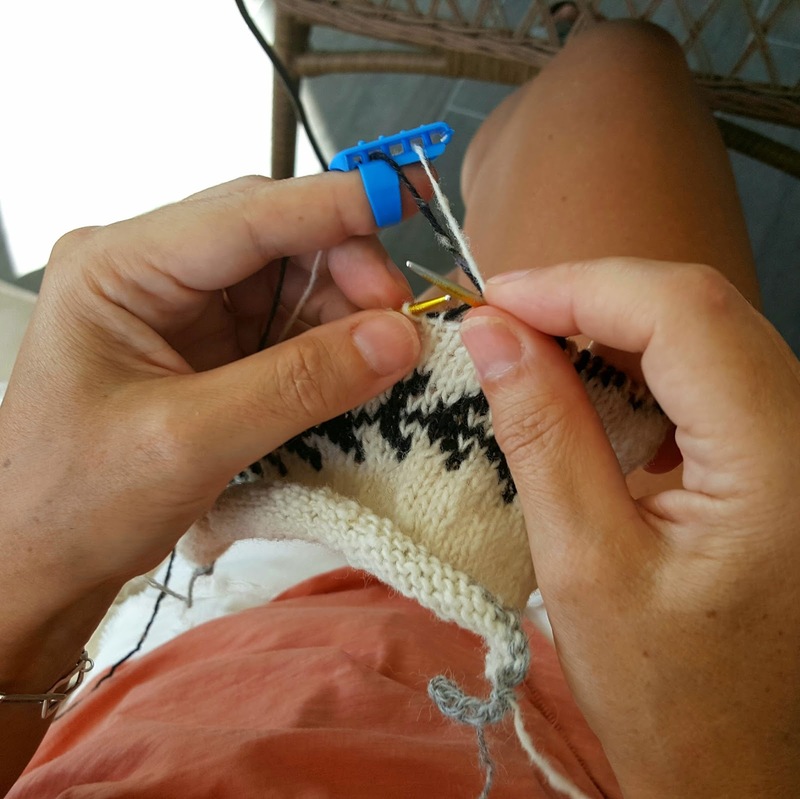 But, since time was an issue, I tried working with the device and it made my life easier and my knitting much faster. 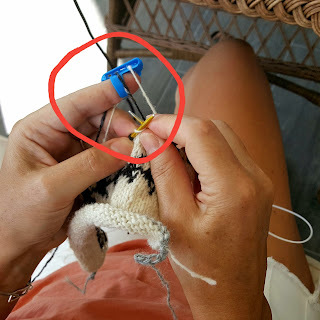 It is called "yarn stranding tool" and you can buy it in several places and try it yourself. It is extremely handy when you figure out how to use it properly. To my astonishment I left Florida with a back and a sleeve finished, and half of a second sleeve on the needles. Before I forget, I used needles in two sizes - 2,5 (US1 1/2) and 3 mm (US2). 2,5 mm - for all white parts, and 3 mm - for the color work. I was really afraid that after washing the black color would bleed (it happened to this yarn in Bainbridge that I used for my Christmas sweater). And I didn't make any swatch. I just started knitting and kept going. I know, I know. Do as I say not as I do. Make a swatch and wash it - has been my mantra for many years now. Yet, it all worked out nicely. Finishing the sweater took a while because all the details had provisional cast on that I had to unravel, pick up stitches and do the ribbing. In the original pattern there are 20 rows of 2x2 ribs on sleeves, back, and front, and a doubled collar with a color work motif. Since I had an almost finished sweater on my hands already I was able to figure out that the collar with a motif wasn't needed. It would be too warm and thick for my taste so I omitted it. 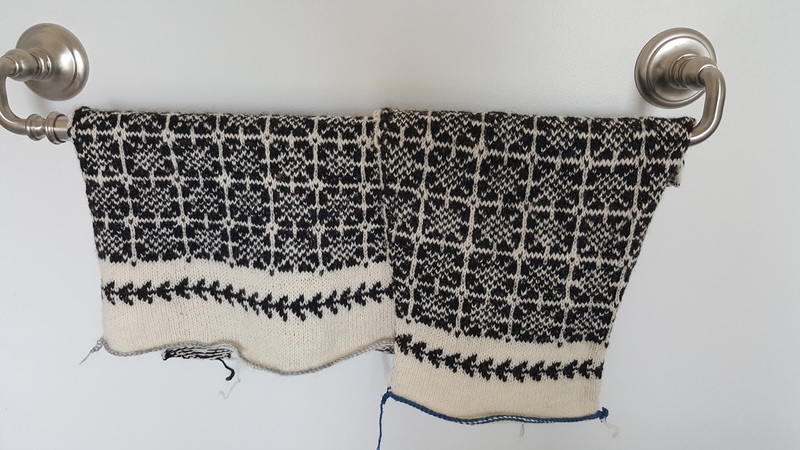 I finished all parts in 1x1 ribs, made only 10 rows for the body, 12 - for sleeves, 6 - for the collar, and used sewn in bind off for additional stretchiness. While working on it I got a little bit worried that it would be too small for me - all the details looked so tiny! Again, I didn't swatch properly and it made me anxious. Maybe that was why I finished this project so fast - wanted to see if it fits me. And after washing, blocking, and steaming it does! Actually, this is the only problem that I see in Japanese patterns - they are made for one size only. Yet, I think, it is not such a big deal - most of the times you don't even need to recalculate everything, just change yarn and needles to get bigger or smaller size. I know, it is a stretch to call a project like this one "basic". It was rather a challenge and I made it on a whim, without any careful planning and preparation. But I loved every minute of the process and I love the result - isn't it the most important in knitting? More pictures on my Ravelry page.